(Nanowerk Spotlight) The ability to produce ammonia (NH3) efficiently from air and water at room temperature and ambient pressure is of great interest in agriculture where it is used in fertilizers. In particular, the electrochemical reduction of nitrogen (N2), in which the conversion of N2 to ammonia takes place under mild conditions, is highly relevant for the chemical industry that needs to cope with increasing demands for ammonia and at the same time is under pressure to reduce its ecological footprint. This would allow replacing the energy-intensive Haber-Bosch process, which requires high temperature and pressure to produce NH3. The most effective catalysts used in electrochemical processes in the chemical industry often are scarce and expensive precious metals such as ruthenium and platinum. This has led chemical engineers to develop catalysts with metal nanoparticles deposited on an inert substrate to reduce the consumption of metal. The minimum size for the dispersed metal is a single atom. These single-atom catalysts have shown unexpectedly remarkable catalytic activity and selectivity, and their tunable electronic structures have sparked heightened interests among researchers in the realm of electrocatalysis. However, in order to prevent the aggregation of single atoms, a substrate is required that can provide efficient anchoring sites to tightly position the single atoms without clustering. In new work, researchers investigated the electrocatalytic N2 fixation on a single transition metal (TM) atom embedded in defective graphitic carbon nitride with density functional theory (DFT) calculations, thereby exploring the fundamental understanding of the electrochemical mechanism for N2 fixation. "Our most significant result is that N2 chemisorption activities of hexagonal close packed and body centered cubic metal atoms decreased as their coordination numbers increased, and the cubic close packed transition metal atoms in NVs-g-C3N4 was found to be lack of N2 chemisorption and activation activity," Wee-Jun Ong, Assistant Professor in the School of Energy and Chemical Engineering at Xiamen University Malaysia, tells Nanowerk. "Our studies could open new research directions in designing novel single-atom catalysts as fascinating electrocatalysts for the application in N2 reduction." In this work, the researchers investigate different single transition metal atoms (e.g. Ti, V, Co, Ni, Zr, Mo, Ru, and Pt) anchored on the graphitic carbon nitride (g-C3N4) with nitrogen vacancies ([email protected]3N4), acting as electrocatalysts for N2 reduction. "Most of the isolated metal atoms can be fixed by the nitrogen vacancy stably after performing the molecular dynamics simulation," explains Ong. "For hexagonal close packed and body centered cubic metal atom, the N2 chemisorption activity decreases as the coordination number of the single atom rises. Nevertheless, the anchored cubic close packed metal atom does not serve as a good site for N2 adsorption and activation even with low-coordination number." Among all studied TM single atoms, the scientists found the single Ti atom to be the most promising catalyst for its excellent N2 reduction performance with a potential-limiting step of 0.51 eV and a rate-determining barrier of 0.57 eV. "This important work demonstrates the deep investigations of various single TM atoms, including the coordination number and binding mode, which are essential to lay a groundwork for the advancement of single atom catalysis toward practical implementation in the arena of energy and environmental science," Ong points out. While g-C3N4 with nitrogen vacancies (NVs) has already proven to exhibit high N2 fixation activity, the adsorption ability of metal-free materials is by far not as good as that of metals. 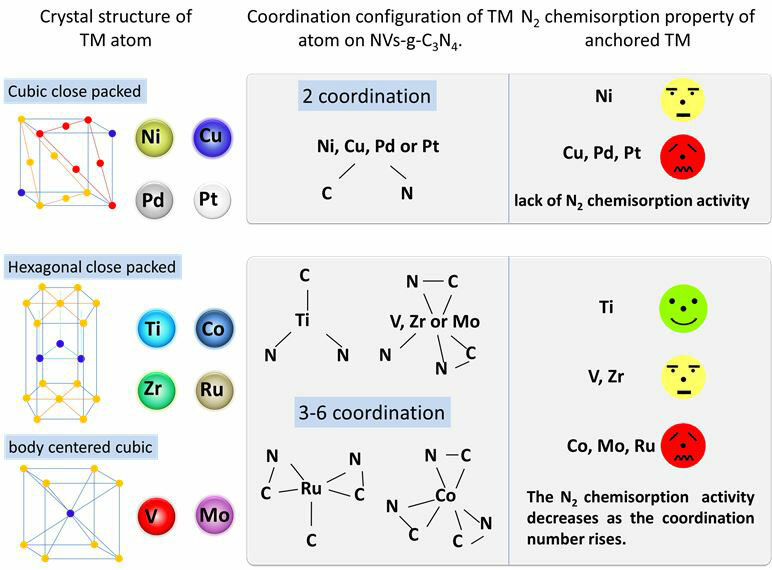 Since NVs can provide a special anchoring site for metal atoms, the researchers in this work demonstrate that the adsorption and catalytic activity for N2 can be further improved by anchoring single TM atoms (especially Ti) in the NVs. "Our results offers an encouraging perspective for the experimental research of N2 fixation in the terms of design of defective structure and selection of transition metal atoms," Ong notes. "The findings paves a way for exploring possibilities of single TM atoms embedded in defective g-C3N4 for potential application in N2 fixation, which can be expanded to other chemical and energy production such as CO2 fixation, H2O splitting and H2O2 production." Further research on single-atom catalysis may focus on understanding the structure-dependent single atom coordination environment and catalytic mechanism with the help of both experimental and theoretical technologies. Achieving abundant active sites and simple synthesis of SACs are currently two main challenges in this fast-moving field. The team's ongoing investigations focus on a universal principle for the design of single-atom electrocatalysts for gas adsorption and conversion – renewable energy.